Magic: The Gathering (colloquially known as Magic cards or just Magic) is both a collectible and digital collectible card game created by Richard Garfield. Released in 1993 by Wizards of the Coast, Magic was the first trading card game and has approximately twenty million players as of 2015[update], and over twenty billion Magic cards produced in the period from 2008 to 2016 alone. Each game of Magic represents a battle between wizards known as planeswalkers who cast spells, use artifacts, and summon creatures as depicted on individual cards in order to defeat their opponents, typically, but not always, by draining them of their 20 starting life points. Although the original concept of the game drew heavily from the motifs of traditional fantasy role-playing games such as Dungeons & Dragons, the gameplay bears little similarity to pencil-and-paper adventure games, while simultaneously having substantially more cards and more complex rules than many other card games. New cards are released on a regular basis through expansion sets. An organized tournament system (the DCI) played at the international level and a worldwide community of professional Magic players have developed, as well as a substantial resale market for Magic cards. Certain cards can be monetarily valuable due to their rarity in production and utility in gameplay, with prices ranging from a few cents to thousands of dollars. Richard Garfield was a doctoral candidate in combinatorial mathematics at University of Pennsylvania when he first started to design the game. During his free time he worked with local volunteer playtesters to help refine the game. He had been brought on as an adjunct professor at Whitman College in 1991 when Peter Adkison (then CEO of Wizards of the Coast games company) first met with Garfield to discuss Garfield's new game RoboRally. Adkison saw the game as very promising, but decided that Wizards of the Coast lacked the resources to produce it at that point. He did like Garfield's ideas and mentioned that he was looking for a portable game that could be played in the downtime that frequently occurs at gaming conventions. Garfield returned and presented the general outline of the concept of a trading card game. It was based on Garfield's game Five Magics from 1982. Adkison immediately saw the potential of this idea and agreed to produce it. 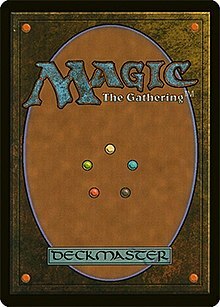 Magic: The Gathering underwent a general release on August 5, 1993. While the game was simply called Magic through most of playtesting, when the game had to be officially named a lawyer informed them that the name Magic was too generic to be trademarked. Mana Clash was instead chosen to be the name used in the first solicitation of the game, however, everybody involved with the game continued to refer to it as Magic. After further consultation with the lawyer, it was decided to rename the game Magic: The Gathering, thus enabling the name to be trademarked. Magic was an immediate success for Wizards of the Coast. Early on they were even reluctant to advertise the game because they were unable to keep pace with existing demand. Initially Magic attracted many Dungeons & Dragons players, but the following included all types of other people as well. The success of the game quickly led to the creation of similar games by other companies as well as Wizards of the Coast themselves. Companion Games produced the Galactic Empires CCG (the first science fiction trading card game), which allowed players to pay for and design their own promotional cards, while TSR created the Spellfire game, which eventually included five editions in six languages, plus twelve expansion sets. Wizards of the Coast produced Jyhad (now called Vampire: The Eternal Struggle), a game about modern-day vampires. Other similar games included trading card games based on Star Trek and Star Wars. Magic is often cited as an example of a 1990s collecting fad, though the game's makers were able to overcome the bubble traditionally associated with collecting fads. The success of the initial edition prompted a reissue later in 1993, along with expansions to the game. Arabian Nights was released as the first expansion in December 1993. New expansions and revisions of the base game ("Core Sets") have since been released on a regular basis, amounting to four releases a year. By the end of 1994, the game had printed over a billion cards. Until the release of Mirage in 1996, expansions were released on an irregular basis. Beginning in 2009 one revision of the core set and a set of three related expansions called a "block" were released every year. This system was revised in 2015, with the Core Set being eliminated and blocks now consisting of two sets, released biannually. While the essence of the game has always stayed the same, the rules of Magic have undergone three major revisions with the release of the Revised Edition in 1994, Classic Edition in 1999, and Magic 2010 in July 2009. With the release of the Eighth Edition in 2003, Magic also received a major visual redesign. By April 1997, 2 billion cards had been sold. In 1999, Wizards of The Coast was acquired by Hasbro for $325 million, making Magic a Hasbro game. While unofficial methods of online play existed previously,[note 1] Magic Online (often shortened to "MTGO" or "Modo"), an official online version of the game, was released in 2002. A new, updated version of Magic Online was released in April 2008. In January 2014, Hasbro announced a franchise film deal with 20th Century Fox for Magic: The Gathering, saying that they wanted "to launch a massive franchise on the scale of Harry Potter and The Lord of the Rings." Simon Kinberg was to serve as a producer for the project. In June 2014, Fox hired screenwriter Bryan Cogman to write the script for the film. As of 2019, no film has entered production. In February 2018, Wizards noted that between the years of 2008 and 2016 they had printed over 20 billion Magic: the Gathering cards. A 2004 article in USA Today suggested that playing Magic might help improve the social and mental skills of some of the players. The article interviewed players' parents who believe that the game, similar to sports, teaches children how to more gracefully win and lose. Magic also contains a great amount of strategy and vocabulary that children may not be exposed to on a regular basis. Parents also claimed that playing Magic helped keep their children out of trouble, such as using illegal drugs or joining criminal gangs. On the other hand, the article also briefly mentions that Magic can be highly addictive, leading to parents worried about their children's Magic obsession. In addition, until 2007, some of the better players had opportunities to compete for a small number of scholarships. Jordan Weisman, an American game designer and entrepreneur, commented, "I love games that challenge and change our definition of adventure gaming, and Magic: The Gathering is definitely one of a very short list of titles that has accomplished that elusive goal. By combining the collecting and trading elements of baseball cards with the fantasy play dynamics of role-playing games, Magic created a whole new genre of product that changed our industry forever." In addition, several individuals including Richard Garfield and Donato Giancola won personal awards for their contributions to Magic. A game of Magic involves two or more players who are engaged in a battle acting as powerful wizards called planeswalkers. Each player has their own deck, either one previously constructed or made from a limited pool of cards for the event. A player starts the game with twenty "life points" and loses the game when their life total is reduced to zero. A player can also lose if they must draw from an empty deck. In addition, some cards specify other ways to win or lose the game. Garfield has stated that two major influences in his creation of Magic: the Gathering were the games Cosmic Encounter, which first used the concept that normal rules could sometimes be overridden, and Dungeons & Dragons. The "Golden Rule of Magic" states that "Whenever a card's text directly contradicts the rules, the card takes precedence." The Comprehensive Rules, a detailed rulebook, exists to clarify conflicts. Players begin the game by shuffling their decks and then drawing seven cards. Players draw one card at the beginning of each of their turns, except the first player on their first turn unless there are more than 2 players. Players alternate turns. The two basic kinds of cards are "spells" and "lands". Lands provide "mana", or magical energy, which is used as magical fuel when the player attempts to cast spells. Players may only play one land per turn. More powerful spells cost more mana, so as the game progresses more mana becomes available, and the quantity and relative power of the spells played tends to increase. Spells come in several varieties: "sorceries" and "instants" have a single, one-time effect before they go to the "graveyard" (discard pile); "enchantments" and "artifacts" are "permanents" that remain in play after being cast to provide a lasting magical effect; "creature" spells (also a type of permanent) summon creatures that can attack and damage an opponent. The set Lorwyn introduced the new "planeswalker" card type, which represents powerful allies who fight with their own magic abilities. In most Constructed tournament formats, decks are required to be a minimum of sixty cards, with no upper limit. Players may use no more than four copies of any named card, with the exception of "basic lands", which act as a standard resource in Magic, and some specific cards that state otherwise. For example, the card Relentless Rats states that a deck may contain any number of itself. Certain formats such as Commander may limit the number of iterations of a single card players may have in their decks. These are colloquially known as singleton formats. In most Constructed formats, there exists a list of individual cards which have been "restricted" (the card is limited to a single copy per deck) or "banned" (the card is no longer legal for tournament play). These limitations are usually for balance of power reasons, but have been occasionally made because of gameplay mechanics. In "Limited" tournament formats, a small number of cards are opened for play from booster packs or tournament packs, and a minimum deck size of forty cards is enforced. The most popular limited format is Booster Draft, in which players open a booster pack, choose a card from it, and pass it to the player seated next to them. This continues until all the cards have been picked, and then a new pack is opened. Three packs are opened altogether, and the direction of passing alternates left-right-left. Once the draft is done, players create 40-card decks out of the cards they picked and play games with the players they drafted with. Deck building requires strategy as players must choose among thousands of cards which they want to play. This requires players to evaluate the power of their cards, as well as the possible synergies between them, and their possible interactions with the cards they expect to play against (this "metagame" can vary in different locations or time periods). The choice of cards is usually narrowed by the player deciding which colors they want to include in the deck. This decision is a key part of creating a deck. In general, reducing the number of colors used increases the consistency of play and the probability of drawing the lands needed to cast one's spells, at the expense of restricting the range of tactics available to the player. Most spells come in one of five colors. The colors can be seen on the back of the cards, in a pentagonal design, called the "Color Wheel" or "Color Pie". 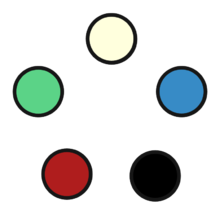 Clockwise from the top, they are: white (W), blue (U), black (B), red (R), and green (G). To play a spell of a given color, at least one mana of that color is required. This mana is normally generated by a basic land: plains for white, island for blue, swamp for black, mountain for red, and forest for green. The balances and distinctions among the five colors form one of the defining aspects of the game. Each color has strengths and weaknesses based on the "style" of magic it represents. White is the color of order, equality, righteousness, healing, law, community, peace, and light. 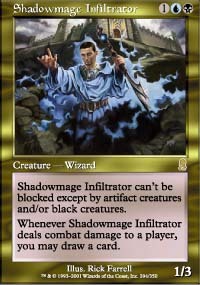 White's strengths include a roster of smaller creatures, as well as the ability to create creature tokens, both of which are strong collectively; protecting and enhancing those creatures with enchantments; increasing one's life points; preventing damage to creatures or players; imposing restrictions on players; disabling the capabilities of opposing creatures; and powerful spells that "equalize" the playing field by destroying all cards of a given type. White creatures are renowned for their defense-favoring abilities, many of which include "Protection" and "Vigilance". White magic opposes artificial fabrication, this being represented by many of its spells that can destroy artifacts and enchantments. White's weaknesses include the fact that many of its spells favor smaller creatures; its passive playing style in which it relies on an opponent's actions to maximize its own effects; and the nature of its most powerful spells that usually affect all players equally—including the casting player. Blue is the color of intellect, reason, illusion, logic, knowledge, manipulation, and trickery, as well as the classical elements of air and water. Blue's strengths include allowing a player to draw additional cards; permanently taking control of an opponent's cards; returning cards from the battlefield to their owner's hand; forcing cards to go directly from a player's deck to their graveyard; and negating spells before they are successfully cast. Blue's creatures tend to be weaker than those of the other colors, but commonly have abilities which make them difficult to block, "Flying" being the most common evasive ability among Blue creatures. Blue's power of extra-sensory perception is represented by the ability "Scry", which allows the player to look at the top cards of his or her deck and choose whether he or she will draw those cards the subsequent turns. Since Blue magic revolves around advancement and technology, it has the highest number of cards having beneficial interactions with artifacts. Blue's weaknesses include its inability to destroy spells already placed on the field, having them returned to the hand instead; the fixation on negating and delaying enemy actions, while itself lacking an aggressive plan; and the way it prolongs the game and victory, thus allowing the opponent a possibility for a sudden comeback. Black is the color of power, ambition, death, illness, corruption, selfishness, amorality, and sacrifice. It is not necessarily evil, though many of its cards refer directly or indirectly to this concept. Black's strengths include the ability to destroy creatures instantly; forcing players to discard cards from their hand; decreasing a player's life while you usually gain that same amount lost; evasive abilities are common among Black creatures; and resurrecting creatures from a player's graveyard. Furthermore, because Black seeks to win at all costs, it has limited access to many abilities or effects that are normally available only to one of the other colors; but these abilities often require large sacrifices of life totals, creatures, cards in hand, cards in library, and other difficult-to-replace resources. One of the most notable abilities among Black creatures is "Deathtouch", which always causes creatures damaged by those possessing this ability to be sent to the graveyard, regardless of the damage amount assigned. Black's main weaknesses include an almost complete inability to deal with enchantments and artifacts; the tendency to inflict itself with severe negative effects in order to defeat the opponent; the way in which it overly relies on cards inside the graveyards; and difficulties in removing other Black creatures. Red is the color of freedom, chaos, passion, creativity, impulse, fury, warfare, lightning, the classical element of fire, and the abiotic geological aspects of the classical element earth. Red's strengths include the ability to directly damage creatures or players; destroying opposing lands and artifacts; and sacrificing permanent resources for temporary but high-profit power. Red has a wide array of creatures, but (with the exception of late-game powerhouses, such as Red's notable dragons) most tend to be defensively weak, rendering them easier to destroy. As a trade-off, some of these weaker creatures have the ability to temporarily raise their offense value, leaving their defense value unaffected; many other Red spells focus on this concept of glass cannon offense. Much like Blue, Red explores the element of trickery, this being represented by spells that are able to temporarily steal an opponent's creatures; divert or copy other spells; and those involving random chance. In terms of keyword abilities, Red tends to focus on quickness and speed, this being represented by the popular abilities "Haste" and "First Strike". Red's weaknesses include its inability to destroy enchantments; the self-destructive, single-use nature of many of its spells; the overall lack of defense value or toughness of its creatures; and the way in which it trades early-game speed and vulnerability for late-game staying power, in which it may not last that long. Green is the color of life, nature, evolution/adaptability, ecology, interdependence, instinct, and indulgence. Green's strengths are on the battlefield, usually winning by means of combat with creatures, of which it has a broad menagerie. These tend to be notably strong at a low mana cost and have abilities that make them more survivable, the two most common being "Regenerate" and "Hexproof". Many of Green's creatures also possess the ability "Trample", which allows the attacking creature to deal combat damage to an opponent even if blocked by a weaker creature. Recurring elements among Green spells include increasing a creature's offense and defense value, temporarily or permanently; forcing two or more creature to fight with each other head-on; the opposition against creatures with "Flying"; and the ability to create creature tokens. Green spells often focus on growth, this being represented by gaining life points; generating extra quantities of mana; and directly obtaining land cards, thus allowing the player to cast their more expensive spells quicker than usual. Since Green magic revolves around natural order, many of its spells can destroy opposing artifacts and enchantments; notably, Green has the fewest cards having beneficial interactions with artifacts. Green's weaknesses include its inability to prevent non-combat-related attacks, namely actions that affect the hand, library, or graveyard; its one-track method of destroying enemy creatures through combat only; and its trouble stopping attacking creatures that have bypassed Green's own powerful creatures, beyond them being very little protection left. Multi-color cards were introduced in the Legends set and typically use a gold frame to distinguish them from mono-color cards. These cards require mana from two or more different colors to be played and count as belonging to each of the colors used to play them. Multi-color cards typically combine the philosophy and mechanics of all the colors used in the spell's cost, and tend to be proportionally more powerful compared to single-color or hybrid cards, as requiring multiple colors of mana makes them harder to cast. More recently, two-color "hybrid" cards were introduced in the Ravnica set, and appeared extensively throughout the Shadowmoor and Eventide sets. Hybrid cards are distinguished by a gradient frame with those two colors, and can be paid with either of the card's colors; for instance, a card with two hybrid-red/white icons can be cast using two red mana, two white mana, or one of each. Several sets have made multi-colored cards a theme, including Invasion, Shards of Alara, both Ravnica blocks and others. Core sets do not typically include multi-color cards in them, although the Core 2013 set was the first to do so. Colorless cards belong to no color, and most often appear in the form of Lands, Artifacts, or cards related to the Eldrazi creature type. Unlike the five colors, Colorless cards do not have a specific personality or style of play. Sometimes, colorless cards will imitate the mechanics of a particular color, though in a less-efficient manner than a similar colored card. Often colorless cards are linked to one or more colors via their abilities, through story references, or through flavor text on the cards themselves. With the Rise of the Eldrazi expansion, however, colorless cards that are neither artifacts nor lands have been introduced for the first time in larger quantities. These cards have been more recently featured in the Battle for Zendikar set that was released in 2015. Magic, like many other games, combines chance and skill. One frequent complaint about the game involves the notion that there is too much luck involved, especially concerning possessing too many or too few lands. Early in the game especially, too many or too few lands could ruin a player's chance at victory without the player having made a mistake. This in-game statistical variance can be minimized by proper deck construction, as an appropriate land count can reduce mana problems. In Duels of the Planeswalkers 2012, the land count is automatically adjusted to 40% of the total deck size. A "mulligan" rule was introduced into the game, first informally in casual play and then in the official game rules. The most current mulligan rule allows players to shuffle an unsatisfactory opening hand back into the deck at the start of the game, draw a new hand with one fewer card, and repeat until satisfied, after which any player who has fewer than seven cards may look at the top card of his or her deck and either return it or put it at the bottom of the deck. In multiplayer, a player may take one mulligan without penalty, while subsequent mulligans will still cost one card (a rule known as "Partial Paris mulligan"). The original mulligan allowed a player a single redraw of seven new cards if that player's initial hand contained seven or zero lands. A variation of this rule called a "forced mulligan" is still used in some casual play circles and in multiplayer formats on Magic Online, and allows a single "free" redraw of seven new cards if a player's initial hand contains seven, six, one or zero lands. Confessing his love for games combining both luck and skill, Magic creator Richard Garfield admitted its influence in his design of Magic. In addressing the complaint about luck influencing a game, Garfield states that new and casual players tend to appreciate luck as a leveling effect, since randomness can increase their chances of winning against a more skilled player. Meanwhile, a player with higher skills appreciates a game with less chance, as the higher degree of control increases their chances of winning. According to Garfield, Magic has and would likely continue decreasing its degree of luck as the game matured. The "Mulligan rule", as well as card design, past vs. present, are good examples of this trend. He feels that this is a universal trend for maturing games. Garfield explained using chess as an example, that unlike modern chess, in predecessors, players would use dice to determine which chess piece to move. The original set of rules prescribed that all games were to be played for ante. Garfield was partly inspired by the game of marbles and wanted folks to play with the cards rather than collect them. For Magic, each player removed a card at random from the deck they wished to play with and the two cards would be set aside as the ante. At the end of the match, the winner would take and keep both cards. Early sets included a few cards with rules designed to interact with this gambling aspect, allowing replacements of cards up for ante, adding more cards to the ante, or even permanently trading cards in play. The ante concept became controversial because many regions had restrictions on games of chance. The rule was later made optional because of these restrictions and because of players' reluctance to possibly lose a card that they owned. The gambling rule is forbidden at sanctioned events and is now mostly a relic of the past, though it still sees occasional usage in friendly games as well as the prismatic format. The last card to mention ante was printed in the 1995 expansion set Homelands. In "Constructed" tournaments, each player arrives with a pre-built deck, which must have a minimum of sixty cards and follow other deck construction rules. The deck may also have up to a fifteen card sideboard, which allows players to modify their deck. Normally the first player to win two games is the winner of the match. Different formats of Constructed Magic exist, each allowing different cards. The DCI maintains a "Banned and Restricted List" for each format; players may not use banned cards at all, and restricted cards are limited to one copy per deck. The DCI bans cards that it determines are damaging the health of a format; it seeks to use this remedy as infrequently as possible, and only a handful of cards have been banned in recent years. Standard, formerly known as Type 2, contains anywhere from five to eight sets. The Standard card pool undergoes a "rotation" once a year, usually in October, when older sets rotate out of the format and the fall set is released. As of October 10, 2018, the Standard card pool consists of Ixalan, Rivals of Ixalan, Dominaria, Core Set 2019, Guilds of Ravnica, and Ravnica Allegiance, with one card banned. For the history of Standard, see Timeline of Magic: the Gathering Standard (Type II). Modern is a non-rotating format where all previously standard legal cards from 8th Edition forward are legal. It was first played at the Magic Online 2011 Community Cup, a response to players' desire for a non-rotating format that is more accessible to newer players. Wizards of the Coast introduced Modern as a legal format on August 12, 2011, and saw its first paper magic play at Pro Tour Philadelphia 2011. Certain cards that released in products that are not standard legal such as Planechase or Commander series cards, are not legal in Modern. Legacy is an Eternal format, meaning it allows every card ever printed except cards on the Legacy banned list. It is distinguished from Vintage in that certain cards are banned for power reasons. Vintage is an Eternal format, meaning it allows every card ever printed except the Vintage banned list. The only banned cards in Vintage are cards using the "ante" mechanic or have "dexterity issues" which the DCI considers inappropriate for competitive Magic. However there is a unique "Restricted List" where only a single copy of a card is allowed to be played instead of the traditional 4. Because of the expense in acquiring the scarce old cards to play competitive Vintage, some unsanctioned Vintage tournaments permit players to proxy a certain number of cards. Proxy cards are forbidden in DCI-sanctioned tournaments, except as replacements for damaged cards when created by the event judge. Pauper is a format that only allows cards with the common rarity to be played. Although the format is played mainly on Magic: The Gathering Online, it has seen a physical resurgence after Pauper was featured in several Grand Prix events. Commander (originally known as Elder Dragon Highlander or EDH) is a casual format, but can be played competitively. In this format each player constructs a 100 singleton deck that has a legendary creature that acts as a commander. The deck construction is limited to the colors that are represented by the chosen commander and there cannot be two or more cards with the same name with the exception of basic lands. The legendary creature chosen as commander is kept in a special "command zone" and may be cast at any time you can afford to cast the creature. If the commander card would enter any zone other than the battlefield from anywhere, its owner has the choice to return that card to the "command zone", where it can be cast again for an additional two generic mana to its regular cost. The banned list and unique rules are governed by an independent body (not by Wizards of the Coast), although Wizards of the Coast has tried to make variants of Commander like 1v1 Commander, which has its own banlist, and Brawl, which only allows the use of Standard-legal cards. Wizards of the Coast releases pre-built commander decks on a yearly basis. Two Headed Giant is a multiplayer format played in two-player teams. One team shares a life total and their turn phases, but have separate mana, cards, decks, and battlefields, and graveyards. Each player can block any creatures that are attacking them, their teammate, or any planeswalker their team controls. Cards that read "each opponent" or "each player" target each opponent, not the team together. Booster Draft is usually played with eight players. The players are seated around a table and each player is given three booster packs. Each player opens a pack, selects a card from it, and passes the remaining cards to the next player. Each player then selects one of the remaining cards from the pack he or she just received, and passes the remaining cards again. This continues until all of the cards are depleted. Players pass left for the first and third packs, and right for the second. Players then build decks out of any of the cards that they selected during the drafting. Talking, signaling, and showing cards is forbidden during the drafting process, except for double faced cards from the Innistrad and Shadows over Innistrad blocks and "Magic Origins", which cannot be hidden as each side of the physical card has a spell printed on it. The DCI maintains a set of rules for being able to sanction tournaments, as well as runs its own circuit. Local shops often offer "Friday Night Magic" tournaments as a stepping-stone to more competitive play. The DCI runs the Pro Tour as a series of major tournaments to attract interest. The right to compete in a Pro Tour has to be earned by either winning a Pro Tour Qualifier Tournament or being successful in a previous tournament on a similar level. A Pro Tour is usually structured into two days of individual competition played in the Swiss format. On the final day, the top eight players compete with each other in an elimination format to select the winner. At the end of the year the Magic World Championship is held. The World Championship functions like a Pro Tour, except that competitors have to present their skill in three different formats (usually Standard, booster draft and a second constructed format) rather than one. Another difference is that invitation to the World Championship can be gained not through Pro Tour Qualifiers, but via the national championship of a country. Most countries send their top four players of the tournament as representatives, though nations with minor Magic playing communities may send just one player. The World Championship also has a team-based competition, where the national teams compete with each other. Invitation to a Pro Tour, Pro Points and prize money can also be earned in lesser tournaments called Grand Prix that are open to the general public and are held more frequently throughout the year. Grand Prix events are usually the largest Magic tournaments, sometimes drawing more than 2,000 players. The largest Magic tournament ever held was Grand Prix: Las Vegas in June 2013 with a total of 4,500 players. Magic: The Gathering cards are produced in much the same way as normal playing cards. Each Magic card, approximately 63 × 88 mm in size (2.5 by 3.5 inches), has a face which displays the card's name and rules text as well as an illustration appropriate to the card's concept. 18,970 unique cards have been produced for the game as of September 2016[update], many of them with variant editions, artwork, or layouts, and 600–1000 new ones are added each year. The first Magic cards were printed exclusively in English, but current sets are also printed in Simplified Chinese, Traditional Chinese, French, German, Italian, Japanese, Korean, Portuguese, Russian, and Spanish. The majority of cards are sold in booster packs, which contain fifteen cards normally divided into four rarities, which can be differentiated by the color of the expansion symbol. [note 2] A fifteen-card Booster Pack will typically contain one rare (gold), three uncommons (silver), ten commons (black), and one basic land (colored black, as commons). Sets prior to Shards of Alara contained eleven commons instead of a basic land. Each set since Kaladesh features two Planeswalker decks, which are meant to help new players learn the game. They contain a 60-card pre-constructed deck with an exclusive Planeswalker, as well as several exclusive cards, two booster packs from the set they accompany, as well as a rule guide and a card board box with an image of the included Planeswalker. Each set from Shards of Alara to Eldritch Moon featured five Intro Packs, which fulfilled the same function as planeswalker decks. They contained a 60-card pre-constructed deck, as well as two booster packs from the set they accompany and a rule guide. Each set from Mirrodin Besieged to Gatecrash featured two Event Decks, which were pre-constructed decks designed as an introduction to tournament play. Beginning with Dragon's Maze, each set featured only one Event Deck. However, event decks were discontinued after the set "Battle for Zendikar". Previously, cards were also sold in Tournament Packs typically containing three rares, ten uncommons, thirty-two commons, and thirty basic lands. [note 3] Tournament Packs were discontinued after Shards of Alara. As of 2018, the number of consecutive sets set on the same world varies. For example, although Dominaria takes place in one set, the Guilds of Ravnica block will take place over three sets. In addition, small sets have been removed due to developmental problems and all sets are now large. Prior to this change, sets were put into two-set blocks, starting with a large set and ending with a smaller one three months later. Prior to 2016, expansion sets were released in a three-set block (again, beginning with a larger set followed by two smaller sets). These sets consist almost exclusively of newly designed cards. Contrasting with the wide-ranging Core Set, each expansion is focused around a subset of mechanics and ties into a set storyline. Expansions also dedicate several cards to a handful of particular, often newly introduced, game mechanics. The Core Sets began to be released annually (previously biennially) in July 2009 coinciding with the name change from 10th Edition to Magic 2010. This shift also introduced new, never before printed cards into the core set, something that previously had never been done. However, core sets were discontinued following the release of Magic Origins, on July 17, 2015, at the same time that two-set blocks were introduced. Wizards of Coast announced on June 12, 2017 that they plan on revamping and reintroducing a revamped core set, and Core Set 2019 was released on July 13, 2018. In addition to the quarterly set releases, Magic cards are released in other products as well, such as the Planechase and Archenemy spin-off games. These combine reprinted Magic cards with new, oversized cards with new functionality. Magic cards are also printed specifically for collectors, such as the From the Vault and Premium Deck Series sets, which contain exclusively premium foil cards. In 2003, starting with the Eighth Edition Core Set, the game went through its biggest visual change since its creation—a new card frame layout was developed to allow more rules text and larger art on the cards, while reducing the thick, colored border to a minimum. The new frame design aimed to improve contrast and readability using black type instead of the previous white, a new font, and partitioned areas for the name, card type, and power and toughness. The card frame was changed once again in Core Set 2015, which maintained the same templating, but made the card sleeker and added a holo-foil stamp to every rare and mythic card to curtail counterfeiting. Magic: The Gathering video games, comics, and books have been produced under licensing or directly by Wizards of the Coast. In September 2011, Hasbro and IDW Publishing accorded to make a four-issue mini-series about Magic: The Gathering with a new story but heavily based on MTG elements and with a new Planeswalker called Dack Fayden, which story is mainly developed in the planes of Ravnica and Innistrad. The ongoing series started in February 2012. In 2015 Wizards of the Coast and Hasbro published Magic: The Gathering – Arena of the Planeswalkers. Arena of the Planeswalkers is a tactical boardgame where the players maneuver miniatures over a customizable board game, and the ruleset and terrain is based on Heroscape, but with an addition of spell cards and summoning. The original master set includes miniatures that represent the five Planeswalkers Gideon, Jace, Liliana, Chandra, and Nissa as well as select creatures from the Magic: The Gathering universe. They later released an expansion Battle for Zendikar featuring multi-color Planeswalkers Kiora and Ob Nixilis and a colorless Eldrazi Ruiner, and a second master set Shadows Over Innistrad which has 4 new Planeswalkers and also includes the addition of cryptoliths. While comics and books have mostly been supplements to develop a background story for the game, several video games have been produced which lean in varying degree on the original game. For the first computer games Wizards of the Coast had sold licenses to Acclaim and MicroProse roughly at the same time. While MicroProse's Magic: The Gathering received favorable reviews, Acclaim's Magic: The Gathering: BattleMage was mostly dismissed with negative reaction. With Magic: The Gathering Online or MTGO for short, Wizards developed and released a computer version of the game themselves that allows players to compete online against other players using the original Magic cards and rules. Players purchase digital cards, and are able to play online against each other using their digital collections. Magic: The Gathering Online is the closest to paper magic of the digital alternatives. A stripped down version of MTGO is Magic: The Gathering – Duels of the Planeswalkers which was developed by Stainless Games and released for the Xbox 360 in June 2009. The game was ported to Windows in June of the next year. Six months after the PC release of Duels of the Planeswalkers, the game was ported to the PlayStation 3 platform. The game was the most-played Xbox Live title for two weeks after its release. Stainless continued to release yearly updates to this, culminating in Magic Duels, a free-to-play title released in 2015. Hiberium and D3 Publisher licensed Magic: the Gathering for its mobile game, Magic: The Gathering - Puzzle Quest, combining deck building with match-3-style casual gaming. This was released in December 2015 and continues to be updated with new card sets from the physical game. Cryptic Studios and Perfect World Entertainment have announced plans to create a Magic: The Gathering massively multiplayer online role-playing game, to be released for personal computers and consoles. On November 3, 2017, Magic: The Gathering Arena, the successor to Duels of the Planeswalkers, entered its first closed stress test. On December 2017, the game entered closed beta, before entering open beta on September 27, 2018. In January 2014, 20th Century Fox acquired the rights to produce a Magic: The Gathering film with Simon Kinberg as producer and TSG Entertainment (its co-financing partner), Hasbro Studios and subsidiary company Allspark Pictures as co-financers, after Universal Pictures allegedly dropped the film from their schedule (Both Universal and Hasbro had been developing the original Magic: The Gathering film since 2009). In April 2016, Enter the Battlefield, a documentary about life on the Magic Pro Tour was released. The film was written by Greg Collins, Nathan Holt, and Shawn Kornhauser. Three official parody expansions of Magic exist: Unglued, Unhinged, and Unstable. Most of the cards in these sets feature silver borders and humorous themes. The silver-bordered cards are not legal for play in DCI-sanctioned tournaments. There is an active secondary market in individual cards among players and game shops. Many physical and online stores sell single cards or "playsets" of four of a card. Common cards rarely sell for more than a few cents and are usually sold in bulk. Uncommon cards and weak rare cards typically sell from 10¢ up to $1. The more expensive cards in standard tournament play are typically priced between $1 to $25, although many commonly played cards in the Modern and Legacy formats sell for $50 to $200. Foil versions of rare and mythic rare cards are typically priced at about twice as much as the regular versions. Some of the more sought-after rare and mythic rare cards can have foil versions that cost up to three or four times more than the non-foil versions. A few of the oldest cards, due to smaller printings and limited distribution, are highly valued and rare. This is partly due to the "Reserved List", a list of cards from the sets Alpha to Urza's Destiny (1994–1999) that Wizards has promised never to reprint. 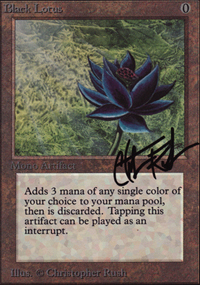 The most expensive card that was in regular print (as opposed to being a promotional or special printing) is Black Lotus. In 2013, a "Pristine 9.5 grade" Beckett Grading Services graded Alpha Black Lotus was bought by an anonymous buyer, for a record $27,302. The secondary market started with comic book stores, and hobby shops displaying and selling cards, with the cards' values determined somewhat arbitrarily by the employees of the store. With the expansion of the internet, prices of cards were determined by the number of tournament deck lists a given card would appear in. If a card was played in a tournament more frequently, the cost of the card would be higher (in addition to the market availability of the card). When eBay, Amazon, and other large online markets started to gain popularity, the Magic secondary market evolved substantially. Buying and selling Magic cards online became a source of income for people who learned how to manipulate the market. Today, the secondary market is so large and complex, it has become an area of study for consumer research, and some people make a career out of market manipulation, creating mathematical models to analyze the growth of cards' worth, and predict the market value of both individual cards, and entire sets of cards. This is called Magic: the Gathering finance. A few early sets experimented with alternate art for cards. However, Wizards came to believe that this impeded easy recognition of a card and that having multiple versions caused confusion when identifying a card at a glance. Consequently, alternate art is now only used sparingly and mostly for promotional cards. [note 4] When older cards are reprinted in new sets, however, Wizards of the Coast usually prints them with new art to make the older cards more collectible, though they sometimes reuse well-received artwork if it makes sense thematically. The original Magic: The Gathering Limited Edition has no overarching storyline, and the cards only have unconnected bits of lore and trivia to give the cards some individual depth. In the early expansion sets until Visions there is usually no real story arc either. Instead, some of these sets are inspired from mythologies of various cultures. This is most apparent in Arabian Nights, that takes some of the One Thousand and One Nights characters and makes them into Magic cards. Norse mythological influences can be seen worked into Ice Age and African influences into Mirage. However, not all of the early sets can be linked as directly to earth mythology. Antiquities touches on an independent storyline about two warring brothers, Urza and Mishra. Homelands is the exception in that period. For this set, a back story was first conceived and the cards in the set were designed afterwards to fit the storyline. Beginning with the Weatherlight expansion there was a shift in the way Magic storylines were used. For the blocks Weatherlight through Apocalypse, the story was laid out in a character driven story, following the events of the Weatherlight ship and its crew. With help of the planeswalking capabilities of the Weatherlight, the protagonists travel through the multiverse to fight Yawgmoth and his army of Phyrexians. Odyssey through Scourge are an unconnected storyline set 100 years later on Dominaria where multiple factions battle for control of the Mirari, a powerful magical artifact left by Karn. After Scourge, Magic storylines have mostly panned away from Dominaria. New planes were created to set the scene for new storylines. In contrast to the previous character driven stories, these releases focused on thematic worlds. This was the model from Mirrodin through Alara, a world split into five magically and culturally distinct "shards" but later reunited. During this block of time, Time Spiral block was released, in which several Dominarian planeswalkers attempted to stop the time rifts that threatened to destroy Dominaria. This block contains the Multiverse-wide event known as the Mending, which powered down the current, godlike planeswalkers to mere mortals that happened to be able to travel to other planes. The event also set up the introduction of the Planeswalker type in Lorwyn block. After Alara, Magic visited Zendikar, a world used as a prison to entrap a race of interplanar parasitic monsters called the Eldrazi, which were inspired by H. P. Lovecraft's Old Ones. Beginning with Zendikar the world-centric storytelling was complemented by an overlying story layer. Planeswalker cards had been introduced in Lorwyn and these Planeswalker characters were used to give the overarching storyline a sense of continuity, despite the constant change of setting. The block following Zendikar, Scars of Mirrodin, revisited the plane of Mirrodin, where the Mirran natives battled against an invading Phyrexian corruption unwittilingly left by Karn (again interconnecting various storylines). To further integrate the storyline into the gameplay, certain events for the second set, Mirrodin Besieged, encouraged players to affiliate themselves with either the Mirran or Phyrexian faction. Much of the recent focus has been on both integrating the play experience with the story line and on making mechanics and individual cards which represent pivotal points in the story. On Innistrad, a plane inspired heavily by gothic horror, its guardian angel has gone missing. Darkness has started to consume the plane, and the players must discover that the Helvault, a magical prison, has been holding the archangel Avacyn as well as demons. Thalia, a cathar of the Church of Avacyn, broke open the Helvault and released Avacyn as well as all of the demons. In the Return to Ravnica block, players were encouraged to affiliate themselves with a guild and take control of the city of Ravnica by completing the maze discovered by Niv-Mizzet. Theros was a plane inspired by Greek mythology, containing many references to Greek mythological figures such as Prometheus and the pantheon of gods. Tarkir would have been a plane where dragons had long since died, controlled by five clans ruled by khans. Through time travel, the result of the struggle between the ancient clans and the dragons was reversed and the dragons now reign over each of the five clans, which are both similar and different to their alternate-timeline predecessors. Battle for Zendikar was a return to the plane of Zendikar, which had been ravaged by the Eldrazi horrors. This marks a change in Magic's storytelling, where each block's story is shown from the perspective of a group of planeswalkers called the Gatewatch. Shadows Over Innistrad was a return to Innistrad, where Avacyn has been corrupted. The next set, Eldritch Moon, focuses on the fact that Emrakul, the most powerful Eldrazi titan that had been missing from the Battle for Zendikar storyline, is now on Innistrad. Together, the Gatewatch must find a way to save the plane from Emrakul's influence. This story also focuses on cosmic horror instead of the traditional gothic horror of old Innistrad. Kaladesh had the Gatewatch go to Chandra Nalaar's home world, the titular plane of Kaladesh, where she finds her mother (presumed dead) and almost kills Tezzeret. Tezzeret later kidnaps Rashmi, winner of the famous Inventor's Fair, and begins a dastardly plot to control the ruling Consulate. With the Consulate imprisoning inventors and confiscating their devices following the Fair, tensions between the populace and the government reach a boiling point, as depicted in Aether Revolt. The block focuses on a Steampunk aesthetic, with the steam replaced by aether, a powerful material that works in nearly every part of life. Amonkhet had the Gatewatch set out to destroy the evil dragon planeswalker Nicol Bolas after learning of his dominion over the titular desert plane Amonkhet. In the desert, they find a city (Naktamun) teeming with food, water, and life, ruled by five gods, with Nicol Bolas seemingly absent altogether. The people of Naktamun train their entire lives to die in ritual combat, hoping to experience pure bliss in the afterlife when the God-Pharaoh (Bolas) returns to Amonkhet. In Hour of Devastation, Bolas returns as prophesied, only to raze Naktamun and reveal the true purpose of the training and combat: to create an army of physically-perfect and combat-adept mummies that serve as an unquestionably loyal army. Although the Gatewatch attempt to defeat Bolas, they are utterly defeated and are forced to flee from Amonkhet. The block's setting is based on ancient Egypt, with themes of social hierarchy and the contrast between life and death. Ixalan centered around the quest for the Golden City of Orazca and the artifact known as the Immortal Sun that lies within it. The tribes vying for the Immortal Sun include; the Sun Empire, an army of dinosaur-riding warriors; the River Heralds, a group of merfolk shamans; the Legion of Dusk, a coalition of vampire conquistadors; and the Brazen Coalition, a fleet of seafaring pirates. The story also follows Jace Beleren, who is stranded on Ixalan without any of his memories after the events of Hour of Devastation, and Vraska, a gorgon agent of Nicol Bolas posing as a pirate on the high seas. In Rivals of Ixalan, the quest for the Immortal Sun reaches its climax as all four tribes attempt to seize the Golden City and as Jace and Vraska attempt to defeat the devious sphinx Azor, the founder of the Azorius guild on Ravnica and the creator of the Immortal Sun. Dominaria was a return to the plane of the same name, which has not been seen in over a decade. The story starts right after the events of Hour of Devastation, and involves Liliana, Chandra, and Gideon on their mission to kill the Demonlord Belzenlok, the final demon that Liliana made a pact with to secure her youth and power. The story arc culminates on Ravnica with Guilds of Ravnica, Ravnica Allegiance, and the upcoming War of the Spark. On Ravnica the guilds are in disorder and chaos, with Bolas manipulating as much as he can. There are several examples of academic, peer-reviewed research concerning different aspects of Magic: The Gathering. One study examined how players use their imaginations when playing. This research studied hobby players and showed how players sought to create and participate in an epic fantasy narrative. Another example used online auctions for Magic cards to test revenue outcomes for various auction types. A third example uses probability to examine Magic card-collecting strategies. Using a specific set of cards in a specialized manner has shown Magic: The Gathering to be Turing complete. ^ Notably, the Apprentice program. See Magic: The Gathering video games. ^ For cards released prior to Exodus, rarities must be checked against an external cardlist or database, as all expansion symbols were black. ^ "Typically" is used due to a change in card distribution in Time Spiral which allows premium cards of any rarity to replace Common cards instead of cards of their own rarity. See Purple Reign for more information. ^ A notable exception are Basic Land cards, but those are easily identifiable due to the oversized mana symbol in their text boxes. ^ "Magic: The Gathering Online Review". Retrieved May 27, 2009. ^ "Magic: the Gathering anniversary Facts & Figures". Wizards of the Coast. 2017. Retrieved July 25, 2018. ^ Tumbusch, T. M. (1995), Tomart's Photo Checklist & Price Guide to Collectible Card Games, Volume One, p. 88. ^ Adkison, Peter (June 1, 2009). "In The Beginning". Wizards of the Coast. Retrieved March 10, 2017. ^ "Alpha, Beta, and Unlimited Editions". Wizards of the Coast. 2008. Retrieved April 18, 2009. ^ Rosewater, Mark (February 16, 2009). "25 Random Things about Magic". Wizards of the Coast. Retrieved August 5, 2009. ^ Varney, Allen (January 9, 1998). "The Year in Gaming". The Austin Chronicle. Retrieved August 27, 2014. ^ "Pokemon USA, Inc. and Wizards of the Coast, Inc. Resolve Dispute". Businesswire. December 29, 2003. Retrieved September 21, 2007. ^ Zane, J. Peder (August 14, 1994). "Trumps, Shmumps: I'll Play My Unicorn". The New York Times. Retrieved September 22, 2016. ^ a b Hannagan, Charley (March 31, 1994). "Magic Playing Cards Conjure Up Big Business – The Cards Turn Player Into Sorcerers Who Cast Spells And Control Creatures". The Post-Standard (Syracuse). p. A1. ^ a b Gaslin, Glenn (October 23, 1994). "Magic: The Gathering". Newport News. p. G1. ^ "Episode 609: The Curse Of The Black Lotus". Planet Money. National Public Radio. March 11, 2015. Retrieved March 9, 2016. ^ "Magic 2010 Rules Changes". Wizards of the Coast. June 10, 2009. Retrieved June 14, 2009. ^ a b Galvin, Chris (June 6, 2005). "The Magic Pro Tour Hall of Fame". Wizards of the Coast. Retrieved September 30, 2006. ^ a b "2009 Pro Tour Prize Structures". The DCI. 2009. Retrieved April 18, 2009. ^ "Neglect and Reversion". The Hardball Times. 2009. Retrieved August 12, 2013. ^ "Disaffected Fans Cheer D&D Buyout". Wired. April 10, 1997. ^ "Magic Online III Launch Blog". Wizards of the Coast. April 16, 2008. Retrieved June 14, 2009. ^ Kit, Borys. (January 13, 2014). Fox to Bring 'Magic: The Gathering' to the Big Screen. Hollywood Reporter. Accessed on January 14, 2014. ^ "'Game Of Thrones' Scribe Bryan Cogman Takes On 'Magic The Gathering' For Fox". deadline.com. June 12, 2014. Retrieved June 18, 2014. ^ "Magic: the Gathering 25th anniversary Facts & Figures". Magic.Wizards.com. Retrieved February 9, 2018. ^ Slavin, Barbara (June 20, 2004). "Magic the Gathering casts its spell". USA Today. Retrieved January 8, 2012. ^ "Magic Scholarship Series : Daily MTG : Magic: The Gathering". Wizards.com. Retrieved June 22, 2010. ^ Weisman, Jordan (2007). "Magic: The Gathering". In Lowder, James. Hobby Games: The 100 Best. Green Ronin Publishing. pp. 192–195. ISBN 978-1-932442-96-0. ^ a b c d e f "Awards". Wizards of the Coast. 2006. Retrieved August 5, 2009. ^ "Origins Award Winners (1993)". Academy of Adventure Gaming Arts & Design. Archived from the original on May 7, 2008. Retrieved April 18, 2009. ^ "Preisträger" (in German). Friedhelm Merz Verlag. Archived from the original on October 9, 2010. Retrieved March 26, 2012. ^ a b "Origins Award Winners (1998)". Academy of Adventure Gaming Arts & Design. Archived from the original on October 31, 2007. Retrieved November 1, 2007. ^ "GAMES Hall of Fame". GAMES Magazine. Archived from the original on April 17, 2010. Retrieved April 9, 2010. ^ "Origins Award Winners (2005)". Academy of Adventure Gaming Arts & Design. Archived from the original on May 16, 2008. Retrieved March 26, 2012. ^ Chalker, Dave. "Origins Awards 2009". critical-hits.com. Retrieved June 14, 2010. ^ "The 38th Annual Origins Awards Winners". The Game Manufacturers Association. Archived from the original on January 27, 2013. Retrieved February 10, 2016. ^ "Origins Award Winners 2015". The Academy of Adventure Gaming Arts & Design. 2015. Archived from the original on February 21, 2016. Retrieved February 10, 2016. ^ "Magic: The Gathering Comprehensive Rules" (PDF). The DCI. July 11, 2009. pp. 7–8. Retrieved July 24, 2009. ^ Fullerton, Tracy (2008-02-08). Game design workshop: a playcentric approach to creating innovative games. ISBN 9780240809748. Retrieved January 8, 2012. ^ "Magic: The Gathering Comprehensive Rules" (PDF). The DCI. July 11, 2009. pp. 5–6. Retrieved July 24, 2009. ^ "Magic: The Gathering Rules". The DCI. February 1, 2009. Retrieved September 24, 2009. This website contains a link to the most up-to-date version of the Comprehensive Rules. ^ "Magic: The Gathering Comprehensive Rules" (PDF). The DCI. July 11, 2009. p. 7. Retrieved July 24, 2009. ^ "Magic: The Gathering Comprehensive Rules" (PDF). The DCI. July 11, 2009. pp. 35–40. Retrieved July 24, 2009. ^ "Magic: The Gathering Comprehensive Rules" (PDF). The DCI. July 11, 2009. p. 5. Retrieved May 4, 2010. ^ "Standard Format Deck Construction". mtgoacademy. Retrieved July 25, 2013. ^ "Commander Format". Wizards of the Coast. 2015. Retrieved May 2, 2015. ^ "Why Magic: The Gathering struggles to remain relevant to casual players". Steve Heisler. 2013. Retrieved May 3, 2015. ^ a b c d e f "Magic: The Gathering Tournament Rules" (PDF). The DCI. July 1, 2009. Retrieved July 24, 2009. ^ LaPille, Tom (July 26, 2009). "Crafting a Vintage". Wizards of the Coast. Retrieved July 24, 2009. ^ "BOOSTER DRAFT". MAGIC: THE GATHERING. Retrieved October 8, 2017. ^ "A Beginners Guide to Magic the Gathering". Kim E Lumbard. 2003. Archived from the original on November 6, 2015. Retrieved July 24, 2009. ^ "Magic The Gathering Tips". oshkoshmagic. Archived from the original on October 6, 2013. Retrieved July 25, 2013. ^ Howell, Dave. "Collector's Card Checklist". Archived from the original on April 2, 2013. Retrieved October 2, 2012. ^ a b c d e f A series of articles written by Mark Rosewater describing each color in depth (as well as multicolor cards, artifact or colorless cards, and color-hybrid cards) can be found at the game's official site at MagicTheGathering.com: The Great White Way, True Blue, In the Black, Seeing Red, It's Not Easy Being Green, Just the Artifacts, Ma'am, and Midas Touch. ^ "Card of the Day — July, 2006". Wizards of the Coast. July 27, 2006. Retrieved September 30, 2006. Black removal spells like Murder or Dark Banishing that could take out large-sized creatures historically had the drawback of not being able to affect other black creatures, and sometimes not artifact creatures either. Since then this drawback has been tweaked in many ways that no longer limit the cards to just non-black or non-artifact. ^ Brady Dommermuth (February 1, 2006). "Ask Wizards". Wizards of the Coast. Retrieved September 26, 2006. The particular issue of red's connection to earth and stone has another aspect as well, though. Red has and will continue to have earth/stone-themed cards. But green wants to be connected to earth as well, in the soil sense. So red gives up a few of its 'earth' cards for green's sake. ^ Mark Rosewater (August 18, 2003). "The Value of Pie". Wizards of the Coast. Retrieved September 30, 2006. ^ Knutson, Ted (September 9, 2006). "Magic Jargon". Wizards of the Coast. Retrieved July 24, 2009. ^ Moldenhauer-Salazar, Jay (March 23, 2000). "Mmmmmmmmmana...Five Rules For Avoiding Mana-Screw". starcitygames.com. Archived from the original on July 20, 2009. Retrieved July 24, 2009. ^ Forsythe, Aaron (August 20, 2015). "New Mulligan Rule Starting from Battle for Zendikar Prereleases". Wizards of the Coast. Retrieved November 26, 2015. ^ Rosewater, Mark (February 23, 2004). "Starting Over". Wizards of the Coast. Retrieved February 11, 2007. ^ Smith, Bennie (April 27, 2006). "Nephilim Are Prismatastic!". Wizards of the Coast. Retrieved February 11, 2007. This article explains this mulligan rule in the Prismatic format, where it is called a "big deck" mulligan. The rule was added to all multiplayer Magic Online later, as explained in this official announcement Archived January 4, 2009, at the Wayback Machine. ^ a b Garfield, Richard (2012). Magic TV: Extra – Dr. Richard Garfield on "Luck Versus Skill" (Magic Cruise 2012) (Video) (Lecture). Seattle to Alaska cruise: www.channelfireball.com. Event occurs at July 10, 2012. Retrieved July 14, 2012. ^ Owens, Thomas S.; Helmer, Diana Star (1996), Inside Collectible Card Games, p. 142. ^ "The Original Magic Rulebook". Wizards of the Coast. December 25, 2004. Retrieved June 14, 2009. ^ "Magic: The Gathering Comprehensive Rules" (PDF). The DCI. July 11, 2009. p. 45. Retrieved April 9, 2010. ^ "5-Color Magic". 5-color.com. Retrieved April 9, 2010. ^ Wizards of the Coast/DCI. "Banned and Restricted Lists". ^ Pro Tour Philadelphia Format Change : Daily MTG : Magic: The Gathering. Wizards.com (August 12, 2011). Retrieved on July 24, 2013. ^ Avi Flamholz (July 13, 2004). "Money, Proxies, and the Must-Have List — A Case for Vintage". Starcitygames. Archived from the original on February 6, 2012. Retrieved September 30, 2006. More and more, the larger U.S. Vintage tournaments are unsanctioned and allow growing numbers of proxies (usually five to ten, sometimes unlimited). In fact, I would be hard pressed to find a sanctioned Type 1 tournament (A.K.A. proxy-free) in the last year or so that drew more than thirty people (other than major conventions like GenCon). ^ Haenig, Greg (December 14, 2011). "New counterfeit and proxy policy". Wizards of the Coast. Retrieved January 20, 2016. ^ Chase, Elaine (January 14, 2016). "On Proxies, Policy, and Communication". Wizards of the Coast. Retrieved January 20, 2016. ^ "Pre-Built Commander Decks". Wizards of the Coast. Retrieved September 20, 2017. ^ "Two Headed Giant". MAGIC: THE GATHERING. Retrieved 2018-10-04. ^ "Friday Night Magic Changes". Wizards of the Coast. October 14, 2014. ^ "Friday Night Magic". Wizards of the Coast. June 2009. Retrieved June 14, 2009. ^ a b "Pro Tour". Wizards of the Coast. 2009. Retrieved June 14, 2009. ^ a b "2009 Magic: The Gathering Worlds Championships". Wizards of the Coast. 2009. Retrieved June 14, 2009. ^ "Grand Prix". Wizards of the Coast. 2009. Retrieved June 14, 2009. ^ "Oliver is the Modern Master in Las Vegas". Wizards of the Coast. June 23, 2013. Retrieved July 9, 2013. ^ "Magic in Korean". Wizards of the Coast. July 23, 2011. Retrieved October 25, 2011. shows the return to 11 languages as of the late release of Magic 2011 in Korean. ^ a b Mark Rosewater (August 25, 2014). "Metamorphosis". Wizards of the Coast. Retrieved June 20, 2016. ^ Aaron Forsythe (February 23, 2009). "Recapturing the Magic with Magic 2010". Wizards of the Coast. Retrieved October 28, 2011. ^ Mark Rosewater. "Metamorphosis 2.0 Decks". Wizards of the Coast. Retrieved September 20, 2017. ^ "Card Face Redesign FAQ". Wizards of the Coast. January 20, 2003. Retrieved September 30, 2006. ^ Rosewater, Mark (July 5, 2004). "Where Have All The Demons Gone Today". Wizards of the Coast. Retrieved April 18, 2009. ^ "Hasbro, Inc., and IDW Publishing to launch Magic: The Gathering Comic Books". IDW Publishing. September 1, 2011. Archived from the original on April 21, 2012. Retrieved May 2, 2012. ^ "Preview: Magic: The Gathering #1". Comic Book Resources. February 1, 2012. Retrieved May 2, 2012. ^ "Magic: The Gathering – Arena of the Planeswalkers". boardgamegeek. 2015. Retrieved July 13, 2015. ^ Lynch, Dennis (March 20, 1997). "Two companies offer The Gathering, but only one is spellbinding". Chicago Tribune. p. 8. ^ Langley, Ryan (July 23, 2009). "XBLA: Magic: The Gathering Sells 170,000 in 5 Weeks". Gamer Bytes. Retrieved August 10, 2009. ^ Minotti, Mike (June 7, 2017). "Magic: The Gathering is becoming an MMO". Venture Beat. Retrieved June 7, 2017. ^ Kit, Borys (January 13, 2014). "Fox to Bring 'Magic: The Gathering' to the Big Screen (Exclusive)". hollywoodreporter. Retrieved February 2, 2016. ^ "Amazon". Retrieved August 28, 2017. ^ "Most Expensive Magic: The Gathering Card". Most Expensive Journal. March 17, 2008. Archived from the original on February 11, 2010. Retrieved December 6, 2009. ^ "Price Change List - Recent Magic The Gathering / MTG Card Price Changes". MTG PeerTrader. Archived from the original on February 11, 2016. Retrieved January 18, 2016. ^ "Official Reprint Policy". Wizards of the Coast. 2002. Retrieved April 18, 2009. ^ Luke Plunkett. "Rare Magic Card Sells For $27,000". Kotaku. Gawker Media. Retrieved May 9, 2015. ^ Bajari, Patrick; Hortaçsu, Ali (January 1, 2004). "Economic Insights from Internet Auctions". Journal of Economic Literature. 42 (2): 457–486. doi:10.1257/0022051041409075. JSTOR 3217179. ^ Bosch, R. A. (2000). "Optimal Card-Collecting Strategies for Magic: The Gathering". The College Mathematics Journal. 31 (1): 15–21. doi:10.2307/2687095. JSTOR 2687095. ^ David Lucking-Reiley (September 2000). "Auctions on the Internet: What's Being Auctioned, and How?" [January 1, 2017]. The Journal of Industrial Economics. 48 (3): 227–252. JSTOR 117554. ^ "StarCityGames.com - Counterfeit Cards". StarCityGames.com. Retrieved May 9, 2015. ^ Jarvis, Jeremy (January 1, 2007). "Ask Wizards". Wizards of the Coast. Retrieved April 21, 2007. In the ‘old days’, art descriptions were vague suggestions of images... Neither continuity nor the idea of worldbuilding (creating distinctive and unique worlds and settings) would become issues until some time later. ^ Buehler, Randy (November 21, 2003). "Flight of Fancy". Wizards of the Coast. Retrieved April 21, 2007. ^ Cavotta, Matt (September 7, 2005). "The Magic Style Guide". Wizards of the Coast. Retrieved April 21, 2007. ^ Chase, Elaine (June 17, 2002). "Ask Wizards". Wizards of the Coast. Retrieved February 15, 2007. While we don't like to completely rule anything out, there currently are not any plans to repeat the alternate art within a set model. The main reason is that most players recognize cards through the artwork. ^ Rosewater, Mark (April 26, 2004). "Collecting My Thoughts". Wizards of the Coast. Retrieved June 30, 2006. ^ "Chinese Skeleton". Wizards of the Coast. March 13, 2002. Retrieved April 18, 2009. ^ "Alternate Chinese Art in Ravnica Part 1". Wizards of the Coast. November 14, 2005. Retrieved April 18, 2009. ^ "And Carnage Shall Follow". Wizards of the Coast. Retrieved March 29, 2010. ^ "Announcing Scars of Mirrodin". Wizards of the Coast. Retrieved March 29, 2010. ^ Martin, Brett A. S. (2004), "Using the Imagination: Consumer Evoking and Thematizing of the Fantastic Imaginary", Journal of Consumer Research, 31 (June), 136-149. ^ Lucking-Reiley, D (1999). "Using Field Experiments to Test Equivalence between Auction Formats: Magic on the Internet" (PDF). American Economic Review. 89 (5): 1063–1080. CiteSeerX 10.1.1.8.8301. doi:10.1257/aer.89.5.1063. JSTOR 117047. Archived from the original (PDF) on April 24, 2003. ^ Bosch, R.A. (2000). "Optimal Card-Collecting Strategies for Magic: The Gathering". College Mathematics Journal. 31 (1): 15–21. doi:10.2307/2687095. JSTOR 2687095. ^ "Magic: the Gathering is Turing Complete". Retrieved January 9, 2013. Baldwin & Waters (1998). The Art of Magic: A Fantasy of World Building and the Art of the Rath Cycle. Renton, WA: Wizards of the Coast. ISBN 978-0-7869-1178-3. Flores, Michael J. (2006). Deckade: 10 Years of Decks, Thoughts and Theory. New York: top8magic.com. ISBN 978-0-9778395-0-6. Moursund, Beth (2002). The Complete Encyclopedia of Magic: The Gathering. New York: Thunder's Mouth Press. ISBN 978-1-56025-443-0.